Would You #SurviveTheNight? The Purge is coming! If, on one night every year, you could commit any crime without facing consequences, what would you do? In an America wracked with crime and overcrowded prisons, the government has sanctioned an annual 12-hour period in which any and all criminal activity–including murder–becomes legal. The police can’t be called. Hospitals suspend help. It’s twelve hours when the citizenry regulates itself without thought of punishment. On this particular night in 2022, plagued by violence and an epidemic of crime, one family wrestles with the decision of who they will become when a stranger comes knocking. When an intruder breaks into James Sandin’s (Ethan Hawke) gated community during the yearly lockdown, he begins a sequence of events that threatens to tear his family apart. Now, it is up to James, his wife, Mary (Lena Headey), and their kids to make it through the night without turning into the monsters from whom they hide. 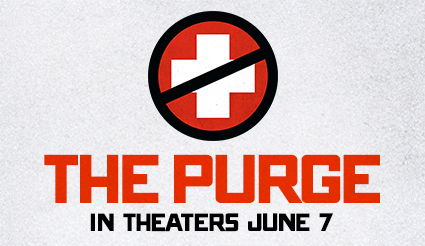 The Purge follows one family over the course of a single night… From sundown to sunrise, for 12 hours, all crime is legal. Four people will be tested to see how far they will go to protect themselves when the danger of the outside world invades their home. Hits theaters everywhere on June 7th. The question is… Would You #SurviveTheNight? Take the quiz to find out! Warn your friends The Purge is coming! One lucky winner will receive a special prize pack including t-shirt and mask.